Only suppliers with deep pockets have the resources to develop cutting-edge technology such as collision avoidance systems, infotainment systems and EV batteries. With global original-equipment revenues of $36.8 billion in 2012, Robert Bosch has the deepest pockets of all. Werner Struth, the management board member in charge of the Americas, says Bosch is betting big on collision avoidance technology, infotainment, diesel fuel systems and lithium ion batteries. Struth described the prospects for these technologies in a Jan. 7 interview at the International CES show in Las Vegas with Special Correspondent David Sedgwick. Q: Bosch is developing collision avoidance technology for hands-free vehicles. What are the next steps? A: The first is automatic parking, and the next is emergency braking for pedestrians. That is what you are going to see. Lately, Bosch has started demonstrating guidance systems for highly autonomous vehicles. What would be the next step for commercialization? We will start with the low-hanging fruit in less complex driving situations. Driving [an autonomous car] in an Asian city would be a real challenge. But if you're driving on a freeway, it is easier. That is why we will introduce a system that allows you to drive [hands-free] up to 130 kph [81 mph] on the autobahn, up to the exit. So you could drive totally hands-free at highway speeds? That is the basic idea. Much earlier than that, we will introduce the lane-keeping function for "traffic jam assist." You can sit in your car, hands-off, and the car goes up to 30 kph [19 mph]. With hands-free driving at highway speeds, would your technology allow automatic lane changes? Let's say you're in the middle lane, and the car ahead is driving slowly. You need a strategy to change lanes. If I have a midrange rear-facing radar, I can understand whether a car is approaching behind me. [Meanwhile] my long-range radar is looking ahead, supported by a video camera. Then you can change lanes. For collision avoidance, then, is it best to have both a radar and a video camera? It's a very good approach. The camera better understands what kind of object is ahead of us, but it doesn't necessarily have precise information about its movement and trajectory. That is why we need the radar. When can we expect commercialization of hands-free technology for the autobahn at high speeds? Three to five years would be reasonable. Has Bosch talked to U.S. or European officials about regulations needed for hands-free vehicles? Everyone talks to everyone. We talk to regulators as well. We provide information and come up with recommendations. How are you approaching the development of infotainment systems? We are combining the world of automotive driving functions and the world of infotainment. The integration of infotainment into the car will see huge [revenue] growth. When it comes to infotainment, is most of your revenue generated by the "head" unit -- the hardware interface for multimedia in the center stack? I think the head unit is one of the most promising developments that we have. It provides a unique opportunity to combine various technologies. We've also talked about mySPIN -- that's a fascinating approach. You're displaying mySPIN at the CES show. It allows motorists to control smartphone apps through the touchscreen or steering wheel controls of any vehicle -- even a rental car, right? You can transfer the experience, function, layout and handling [of the smartphone to the cockpit]. I don't need to adjust from my smartphone to a new layout in the car. It has exactly the same kind of usage as my smartphone, so I'm familiar with that. I don't need [an instruction book] to understand how it works. 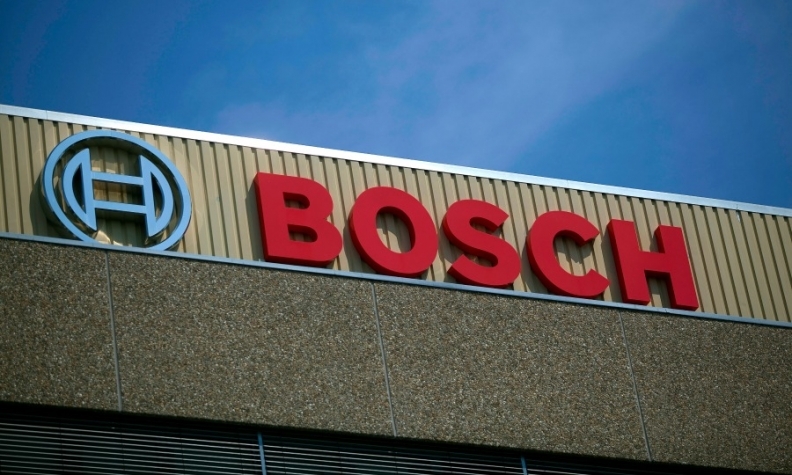 Bosch recently formed a partnership with GS Yuasa International Ltd. to develop lithium ion batteries. Is that market still a decade away? If you go to 2020, we still believe that the [global] share of EVs and hybrid electric vehicles will be maybe 8 to 10 percent. The key question is, "When will we see the turning point when the total cost of ownership of a pure EV compares with a gasoline or diesel-powered vehicle?" I would not be surprised to see that breakeven point in the middle of the next decade. Turbochargers seem to be a hot technology, and now Bosch is marketing its own line of turbos. Are you getting contracts? We are getting customers for the turbo business. I think it was a good move by Bosch to enter that business. In Europe, Bosch is a big supplier of fuel injectors for diesel engines, but diesels never quite caught on in the United States. Are you still optimistic? Absolutely. If you look at cars [sold in the United States] that are available with a diesel engine, the take rate is as high as 30 percent. That's not that far away from some brands we see in Europe. The number of car platforms that have diesel engines is increasing year over year. So that's another reason to believe in it. Are U.S. consumers willing to pay extra for diesel engines? According to some customer research, the willingness of the consumer to pay a premium for diesel engines is increasing year by year. And it exceeds the premium that people are willing to pay for a hybrid car. So there is growing consciousness that diesel engines have benefits. I think that's a good development.